The typical SWS LLC project starts with a visit from one of the SWS team via Go To Meeting where we meet on the phone and on the web to discuss your application / needs. If appropriate SWS LLC will come to your facility to survey current operations and sample the appropriate waters to develop a full current condition profile including cost op operation. Based on client goals, the survey & water test results, various options for improved water use efficiency, or water reuse designs will be developed free of charge. A budgetary figure for each option will be presented that estimates both capital required to build the project, as well as funds needed for operating budgets. 3D models of the proposed solution options may be presented, so that you can see the footprint required to build your project. Once a design is selected, SWS LLC will work with you to design any required longer term sampling needed to identify the current process capability. SWS LLC will work with you if piloting the proposed water reuse water recycling solution is required. Pilots are available for most applications. The final step involves refining the budget and issuance of a firm fixed solution that hits all criteria for success, including both financial and sustainability goals. 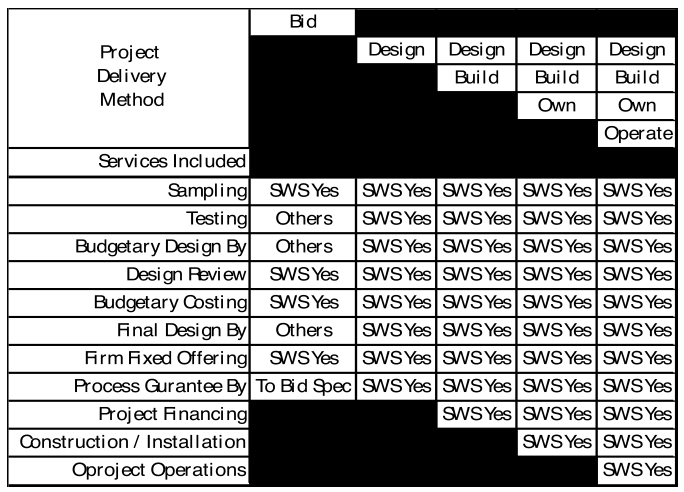 Upon your approval, SWS LLC will issue a full firm fixed design that carries a process guarantee assuring the project will deliver the financial and sustainability goals agreed to – on time.